British soldiers man a Vickers machine gun during the Battle of Menin Road Ridge in 1917. “Military science develops so rapidly in times of actual war that the weapons of today soon is (sic) discarded and something better taken up.”—Attributed to a German agent in Rotterdam in 1915 news stories. Humans proved themselves remarkably ingenuous and adaptable when it came to finding new ways to maim and kill during the First World War. The list below explores many of the weapons used to produce millions of casualties in four short years. Rifles. All nations used more than one type of firearm during the First World War. The rifles most commonly used by the major combatants were, among the Allies, the Lee-Enfield .303 (Britain and Commonwealth), Lebel and Berthier 8mm (France), Mannlicher–Carcano M1891, 6.5mm (Italy), Mosin–Nagant M1891 7.62 (Russia), and Springfield 1903 .30–06 (USA). 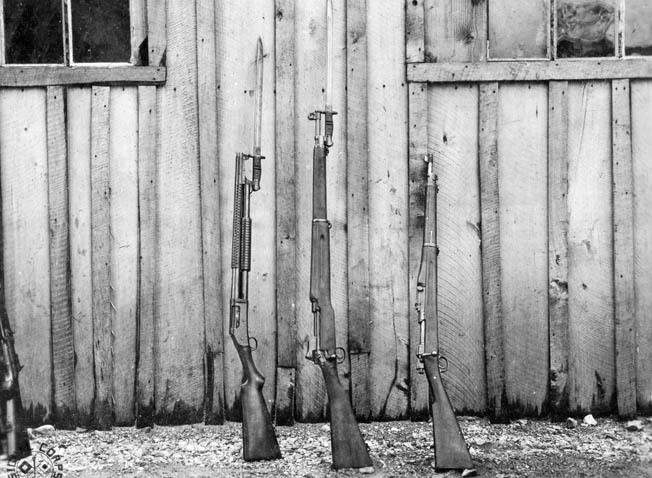 The Central Powers employed Steyr–Mannlicher M95 (Austria-Hungary and Bulgaria), Mauser M98G 7.92mm (Germany), and Mauser M1877 7.65mm (Turkey). The American Springfield used a bolt-action design that so closely copied Mauser’s M1989 that the US Government had to pay a licensing fee to Mauser, a practice that continued until America entered the war. Machine guns. Most machine guns of World War 1 were based on Hiram Maxim’s 1884 design. They had a sustained fire of 450–600 rounds per minute, allowing defenders to cut down attacking waves of enemy troops like a scythe cutting wheat. There was some speculation that the machine gun would completely replace the rifle. Contrary to popular belief, machine guns were not the most lethal weapon of the Great War. That dubious distinction goes to the artillery. Flamethrowers. Reports of infantry using some sort of flame-throwing device can be found as far back as ancient China. During America’s Civil War some Southern newspapers claimed Abraham Lincoln had observed a test of such a weapon. But the first recorded use of hand-held flamethrowers in combat was on February 26, 1915, when the Germans deployed the weapon at Malancourt, near Verdun. Tanks carried on a man’s back used nitrogen pressure to spray fuel oil, which was ignited as it left the muzzle of a small, hand-directed pipe. 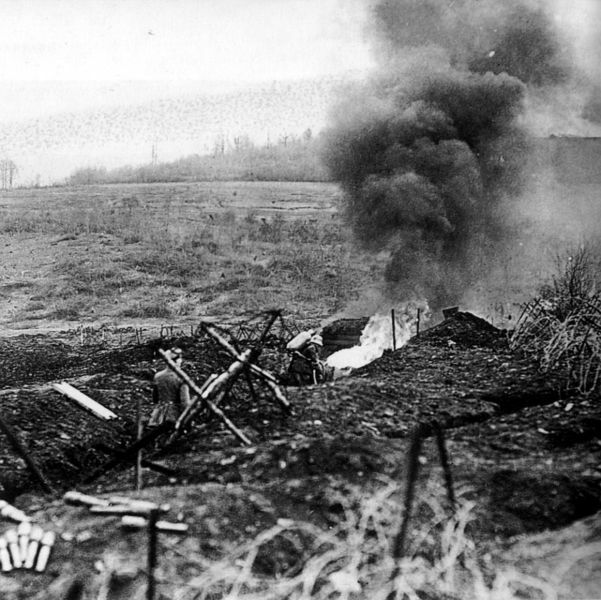 Over the course of the war, Germany utilized 3,000 Flammenwerfer troops; over 650 flamethrower attacks were made. The British and French both developed flame-throwing weapons but did not make such extensive use of them. Mortars. 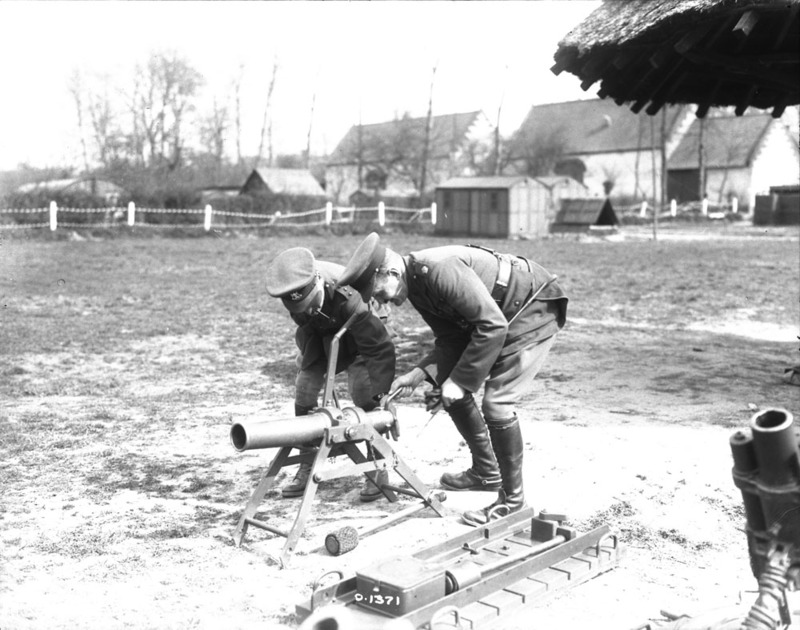 Mortars of World War I were far advanced beyond their earlier counterparts. The British introduced the Stokes mortar design in 1915, which had no moving parts and could fire up to 22 three-inch shells per minute, with a range of 1,200 yards. The Germans developed a mortar (minenwerfer, or “mine thrower”) that had a 10-inch barrel and fired shells loaded with metal balls. A French battery preps a 75mm canon. Artillery. The 20th century’s most significant leap in traditional weapons technology was the increased lethality of artillery due to improvements in gun design, range and ammunition‚—a fact that was all too clear in the Great War, when artillery killed more people than any other weapon did. Some giant guns could hurl projectiles so far that crews had to take into account the rotation of the earth when plotting their fire. 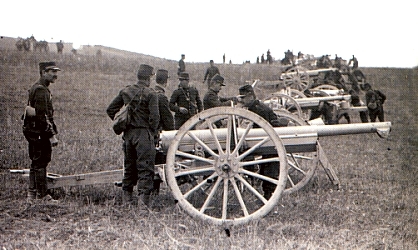 Among smaller field guns, the French 75mm cannon developed a reputation among their German opponents as the “Devil Gun.” French commanders claimed it won the war. French 75 mm field guns also saw action in the Second World War, during which some were modified by the Germans into anti-tank guns with limited success. 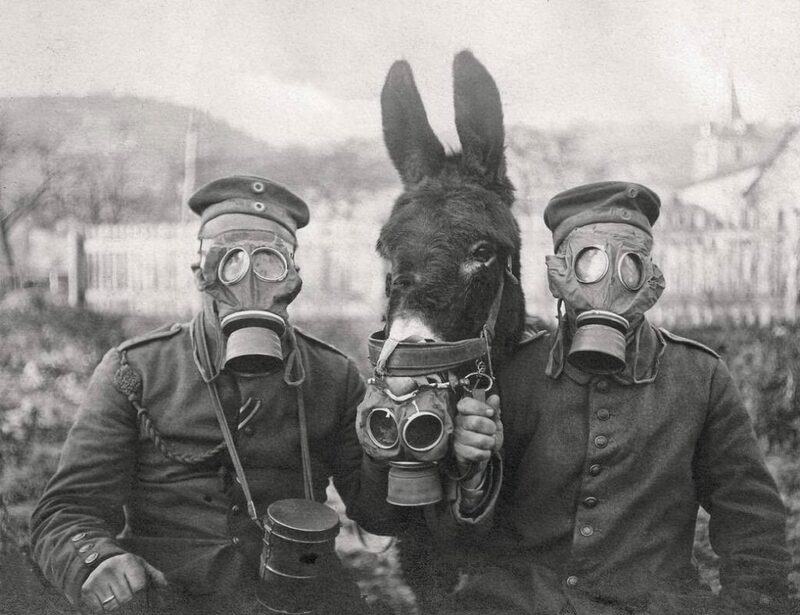 A pair of German soldiers (and their mule) wear GM-15s, Germany's first gas mask. These helped prevent inhalation of mustard gas and other potential biochemicals. Poison gas. On April 22, 1915, German artillery fired cylinders containing chlorine gas in the Ypres area, the beginning of gas attacks in the First World War. Other nations raced to create their own battlefield gases, and both sides found ways to increase the severity and duration of the gases they fired on enemy troop concentrations. Chlorine gas attacked the eyes and respiratory system; mustard gas did the same but also caused blistering on any exposed skin. Comparatively few men died from gas. Most returned to active service after treatment, but the weapon incapacitated large numbers of troops temporarily and spread terror wherever it was used. The use of poison gas was outlawed by international law following the war, but it has been used in some later conflicts, such as the Iran-Iraq War (1980–88). British and French troops in Champagne, France, check out a Renault, the first set of tanks built during WWI. Tanks. Ideas for “land battleships” go back at least as far as the Medieval Era; plans for one are included among the drawings of Leonardo da Vinci. The long-sought weapon became reality during the First World War. 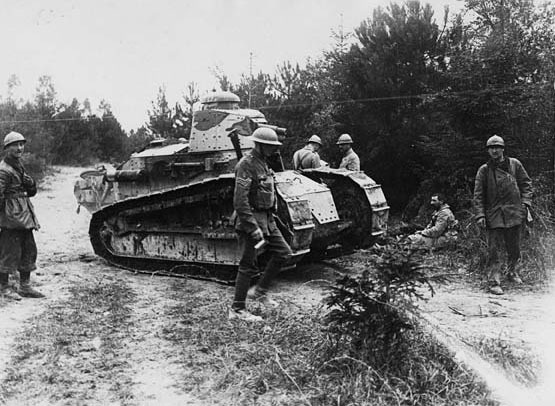 “Tank” was the name the British used as they secretly developed the weapon, and it stuck, even though the French simultaneously developed the Renault FT light armored vehicle, which had a traversable turret, unlike the British designs. (Various reasons have been given for choosing the name “tank,” from shells that were shaped like water-carriers to the British concealing construction of their secret weapon under the guise of making irrigation tanks for sale to Russia.) The first British tank (“Little Willie”) weighed approximately 14 tons, had a top speed of three mph, and broke down frequently. Improved tanks were deployed during the war, but breakdowns remained a significant problem that led many commanders to believe the tank would never play a major role in warfare. The Germans developed an armored fighting vehicle only in response to the British and French deploying tanks. The only German design of the war, A7V, was an awe-inspiring but cumbersome beast that resembled a one-story building on treads. Initially, tanks were doled out in small numbers to support infantry attacks. The Battle of Cambrai, November 20, 1917, is generally regarded as the first use of massed tank formations; the British deployed over 470 of them for that battle. However, the French had already successfully employed 76 tanks during the battle at Malmaison on October 23, 1917, one of the most impressive French victories of the Great War. Aircraft. The air war of World War I continues to fascinate as much as it did at the time. This amazing new technology proved far more useful than most military and political leaders anticipated. Initially used only for reconnaissance, before long planes were armed with machine guns. Once Anthony Fokker developed a method to synchronize a machine gun’s fire with the rotation of the propeller, the airplane became a true weapon. Early aircraft were flimsy, kite-like designs of lightweight wood, fabric and wires. The 80–120 horsepower engines used in 1914 produced top speeds of 100 mph or less; four years later speed had nearly doubled. Protection for pilots remained elusive, but most pilots disdained carrying parachutes regardless. Over the course of the war multi-engine bombers were developed, the largest being Germany’s “Giant,” the Zeppelin-Staaken R.VI, with a wingspan of 138 feet and four engines. It had a range of about 500 miles and a bomb-load capacity of 4,400 lbs., although in long-range operations, such as bombing London, Giants carried only about half that much. Submarines. Britain, France, Russia and the United States of America had all developed submarine forces before Germany began development of its Unterzeeboats (Undersea boats, or U-boats) in 1906, but during World War I submarines came to be particularly associated with the Imperial German Navy, which used them to try to bridge the gap in naval strength it suffered compared to Britain’s Royal Navy. Longer-range U-boats were developed and torpedo quality improved during the war. Submarines could strike unseen from beneath the waves with torpedoes but also surfaced to use their deck gun. One tactic was for the low-riding subs to slip in among a convoy of ships while surfaced, attack and dive. An unsuccessful post-war effort was made to ban submarine warfare, as was done with poison gas.